Hello. A happy new year to you and yours! It’s been quiet here, hasn’t it? Sorry about that. It’s been a year of major events and unexpected delays, meaning that a load of things haven’t really happened the way I’d imagined. The year started with the expectation that a load of things would have happened by the summer and I’d be writing music and blogposts in my summerhouse at the bottom of the garden, looking back on how well the identity project I was working on was ticking along. Scoliosis surgery – not Daisy tho. But then I got moved onto something else at work and all my “creative time” in the evenings was spent desperately trying to get ahead of that. By April it was clear that things weren’t going to plan on the loft. Our 8-10 week project had hit woodworm snags, and we’d found we would have to get the roof retiled and some large cracks in the side wall fixed. But hey, it would be done in time for Daisy’s operation. I had a pang of guilt about the blog mid-June, as I hit 48 and managed to get a post together talking a bit about this. But I wasn’t really in a position to go into the detail on Daisy. Work stayed frantic and complex. And then I was asked to takeover something else even more technical – but it would be great if I could keep my other project going alongside until ‘the new me’ was in place in the new year. Cue more frantic reading on change management, reliability engineering, systems security. And the delays on the building work still grew. We got through three roofing companies before that was finished. The chap tiling the bathroom quietly walked off the site, leaving it unfinished, and nobody had noticed until he was gone. The plumber got really ill. Meanwhile Milo started at secondary school and we went from the chaos of six children+childminder in our house slowly down to, well, just the four of us. So we end the year still not in our new bedroom. The carpet is down, but the walls aren’t painted, the tiling isn’t grouted and the bathroom’s not plumbed in. There are now trenches for the foundations of the studio down at the bottom of the garden. an excel spreadsheet to work out the days-until-I’m-fifty for each post. So I no longer have the tyranny of posting every day, nor the excuse that doing the sums is too complicated. Happy 2018 everyone. Make it a good one. 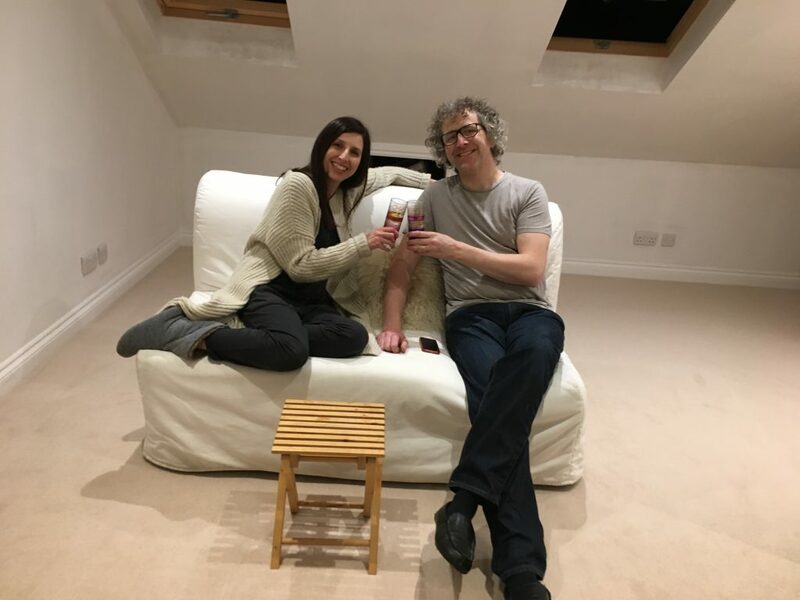 Tom and Vicky in the (nearly finished) loft. This entry was posted in 999 days on December 31, 2017 by Tom. 223 – so what do you actually *do*?